The winners of the Russian Travel Guide TV channel’s photo contest had a chance to go on a five-day tour of the Urals area this year. A correspondent of Russia beyond the Headlines followed them. Five days is far too short a time to get to know the ancient mountain ridge that divides Russia between Europe and Asia, but it is a start. The best place to begin a tour of the Urals is the city of Yekaterinburg. Founded nearly 300 years ago, it is the administrative, cultural, scientific and educational center of a region that developed around the mining industry. For tourists, however, Yekaterinburg is the place where the last Russian tsar and his family were executed. After Nicholas II abdicated the throne, the Bolsheviks decided to get rid of the royal family as quickly as possible, and moved them to Yekaterinburg. Nicholas, his wife Alexandra, their five children and five servants were put up at the house of Nicholas Ipatiev, a mining and civil engineer. They spent 78 days there before being shot in the basement on the night of July 16-17, 1918. As part of a movement to promote tourism in Yekaterinburg, in recent years local authorities have organized and renovated many monuments around the city. This year, a special tour has been developed that takes visitors past the city’s best sites, including those associated with the tsar and monuments marking the border between Europe and Asia. The four-mile tour lasts two to three hours and includes about 30 places of interest. 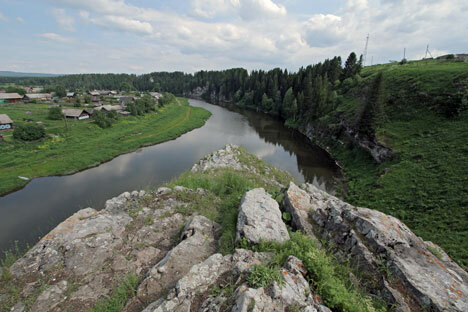 Just a couple of hours’ drive from Yekaterinburg is the site of the annual rafting festival down the Chusovaya River, the only river in the world that flows through both Europe and Asia. In the 18th and 19th centuries, it was the main route for carrying iron produced in the Urals to the western part of Russia. Every year, during the spring floods, barges laden with metal set out from piers on the upper reaches of the river. Drifting down the river during high water was very dangerous and many ships were wrecked against the cliffs. Some of the most dangerous rock formations were later demolished to make the route safer. The river’s significance as a transport route declined after a railway was constructed in 1878, but today, the river is popular with those interested in extreme sports, hikers and kayak enthusiasts. This year, the rafting festival celebrated its 10th anniversary and involved a huge number of events, including concerts by pop and folk groups; master classes in local arts and crafts; screenings of documentary films featuring the Chusovaya River and tastings of traditional Urals food. Visitors could drink tea from a samovar, listen to folk songs and join round dances, have a coin minted as a memento and buy lots of souvenirs. Another notable stop on an itinerary in the Urals is a visit to the open-air factory museum in Nizhny Tagil. The Demidov steel works, which opened in 1725 and operated until 1987, is now a complex that teaches visitors about the history of the iron and steel industry in the Urals. Far more impressive than any guide’s lecture, however, is the sight of giant rusty metal frames, abandoned workshops, the blast furnace and coal carts amid the surrounding wilderness. Rumor has it that the site was used as a location for some Hollywood films, though the guides do not know exactly which. The Urals area has something to suit everyone, from lovers of history to extreme sports enthusiasts to folklore or metal scrap collectors. The trip was sponsored by Tourism Ministry of Sverdlovsk region.